Clip-in dreads with strong hold in 2 inches short hair already. 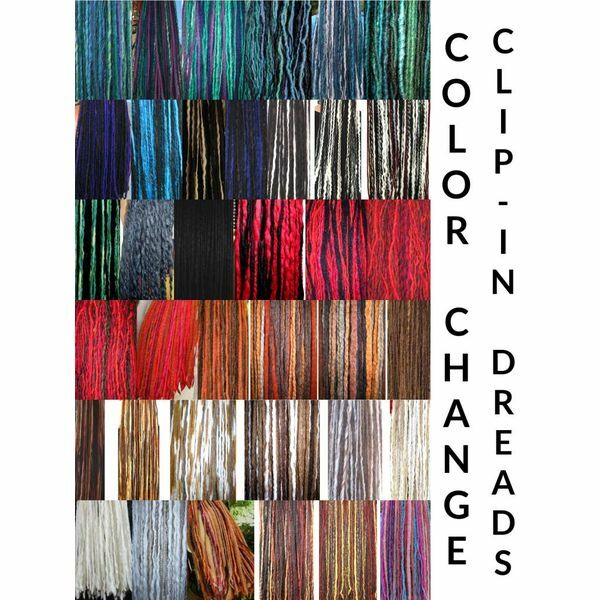 Use them as dread falls in short hair or as colorful dreadlock highlights in your own long hair! 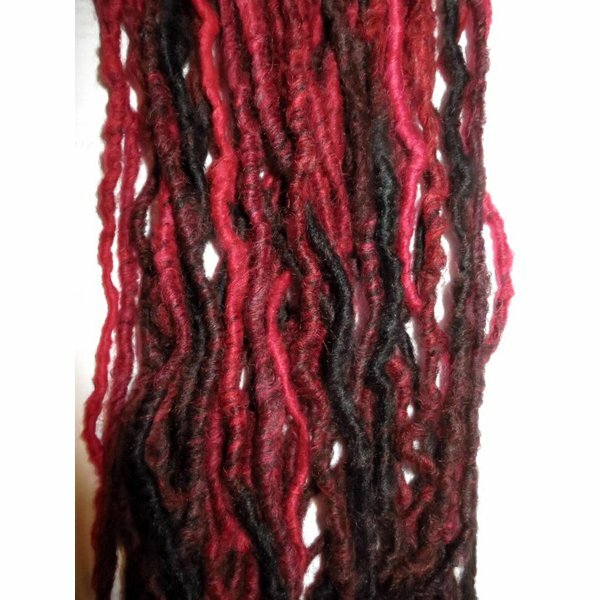 Clip-in dreadlocks by Magic Tribal Hair are made of special super lightweight yarns and provide strong hold in only 5 cm/ 2 inches short hair already! 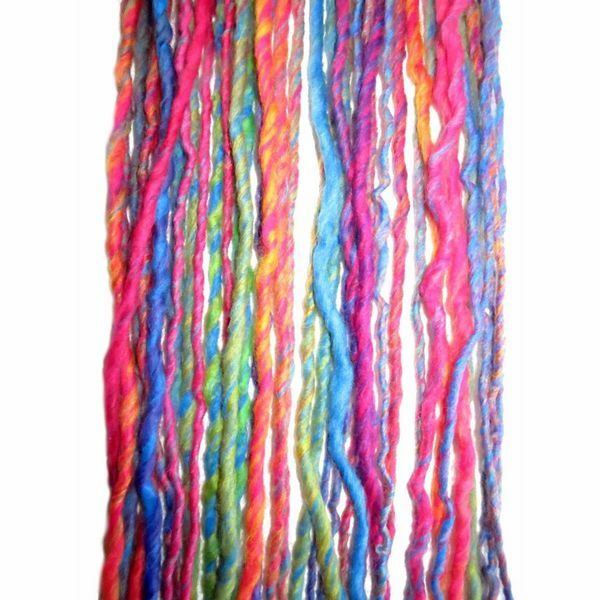 Naturally we seal all yarn-ends to prevent each loc from unravelling and get you a long-lasting hair piece! 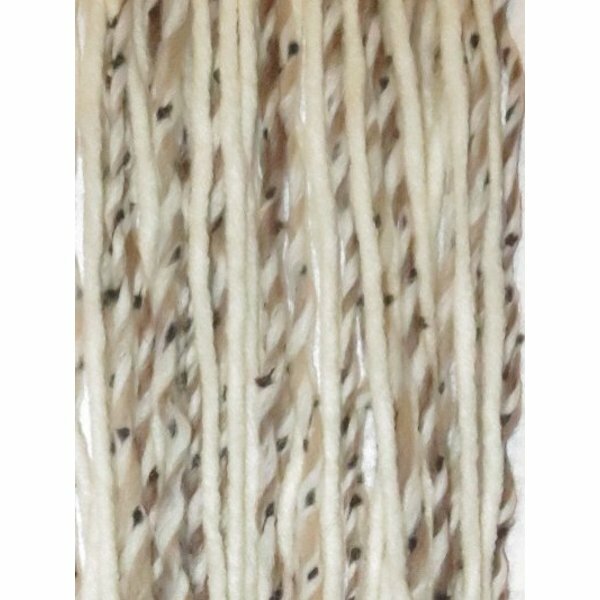 Most of your yarns are made of a wool-synthetics mixture, a couple of dread falls are vegan and of 100 % synthetic fibre, you find a list with links at the bottom of this page. wearing them as colorful highlights in your own, long hair, hair falls or a wig! 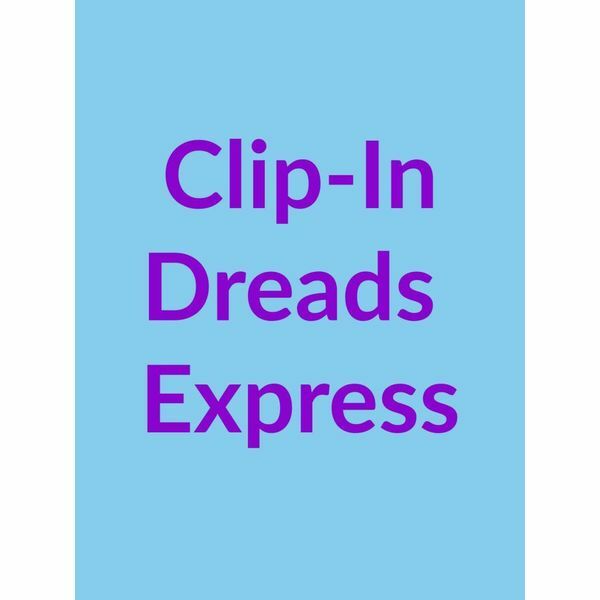 The clips attach easily to your own hair and you can distribute them all over your head to have the single locs mix perfectly with your hair. 2 clip-ins are sufficient for some highlights to frame your face and 5 or 6 clip-ins are what you need to have the gorgeous mix all around your head. Set sizes from 3 clip-ins come with set discount. We matched the maximum lengths of our clip-in dreads to our other hair extensions so you can combine them just like you want to. 22.5 inches long clip-ins work great with all 20 inches long braided and twisted braid extensions and with 22 inches long hair falls. 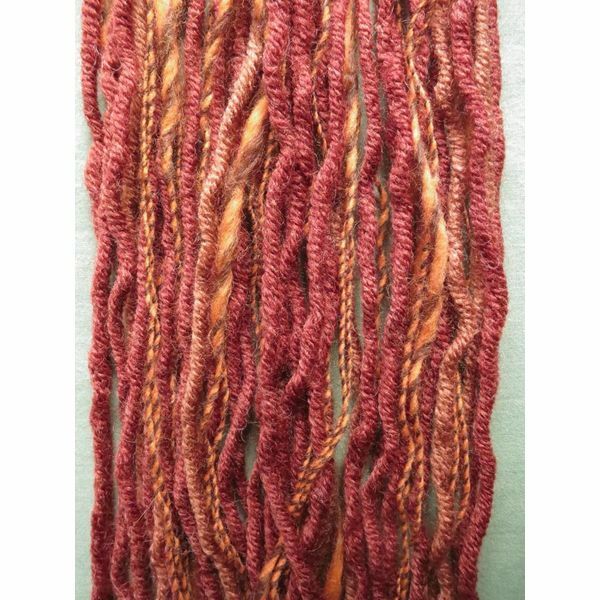 38 inches long dreadlocksclip-ins match all braided and twisted braids of 36 inches length and all hair falls of 39 inches length. 2 clip-ins are sufficient for decorating a braid hair piece or hair falls. 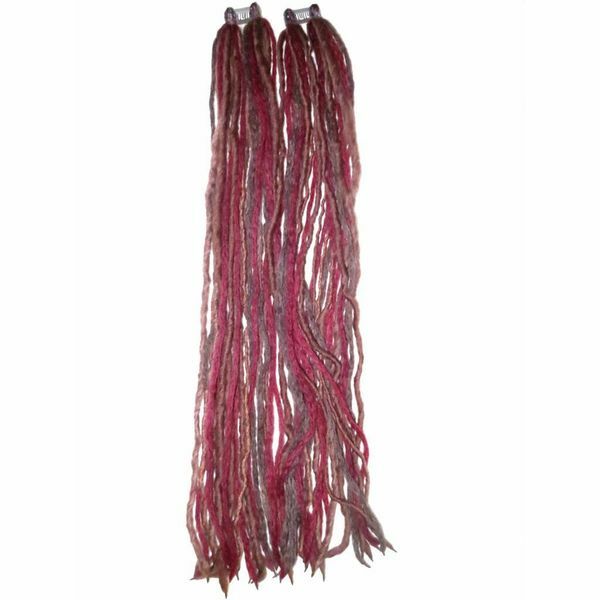 Last but not least you are free to use clip-in dreadlocks by Magic Tribal Hair in any wig. 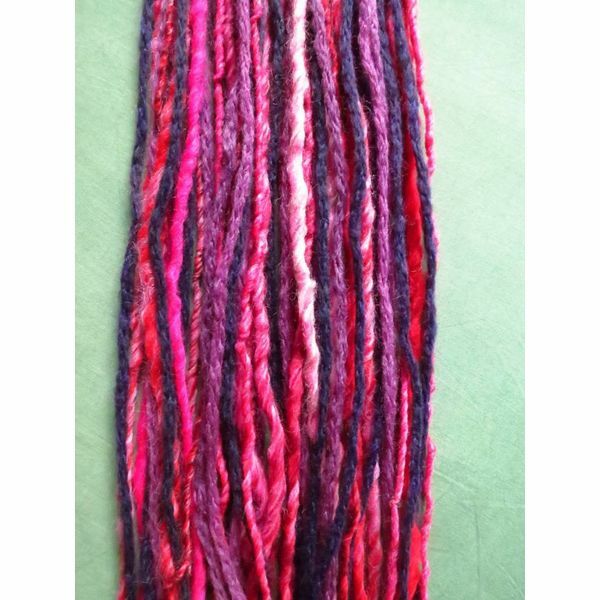 Pay attention to ordering the right length in this case, because we seal the yarn dreadlocks' ends to get you a long-lasting item, so you should not cut them. and for attaching dread falls to really short hair from 5 cm/ 2 inches length! Clip-in dreadlocks are a simple and quick solution for getting a rich dreadlocks mane in very short hair, too. Minimum length is 5 cm/ 2 inches, your hair should not be longer then 10-15 cm/ 4-6 inches, because otherwise your own hair will be too much visible between the dreads, maybe even stick out and destroy the illusion. You also need a hair scarf to hide the fact that these dreads are fake, the hair scarf covers your short hair at the sides of your head. Naturally you can leave your bangs out if this is your preferred look. This hair scarf styling isvery popular among tribal fusion belly dancers and for boho and afrohemian looks, so actually the hair scarf adds another stylish accent to your hairdo. Set sizes from 5 clip-ins upwardsare perfect for this styling, these larger set sizes come with some set discount. 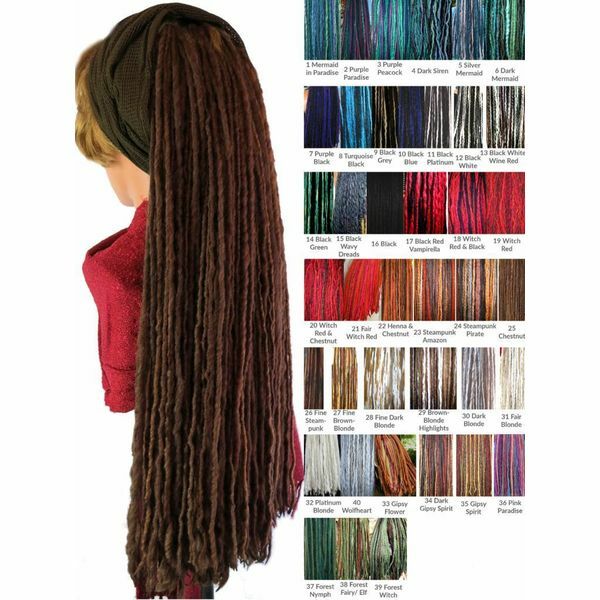 Especially belly dancers and larpers love wearing costume sets, so especially our colorful clip-in dreadlocks have a matching hip & belt tassel model made of the same dreadlock yarns! You find them easily in our hip tassels section, because they have the same name - e.g. color gipsy flower goes with hip tassel gipsy flower. Do you want a super special fantasy hair piece for your cosplay, tribal fusion belly dance or larp costume? 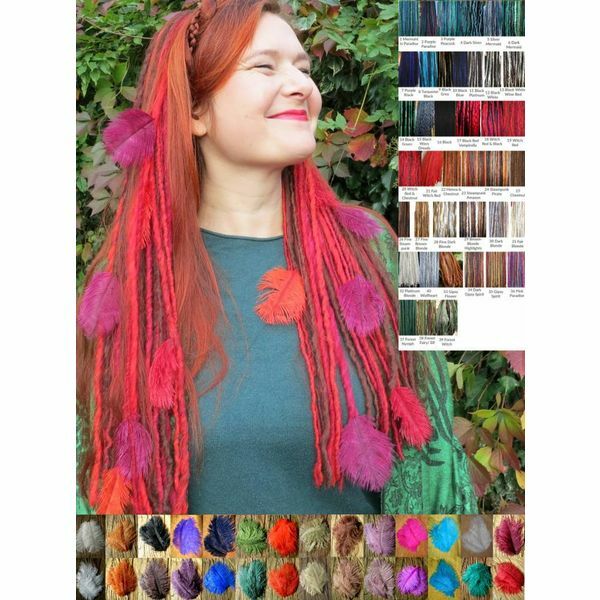 Order your dread fall with peacock feather decoration, peacock fringes or choose from different variants of leaves as decoration! 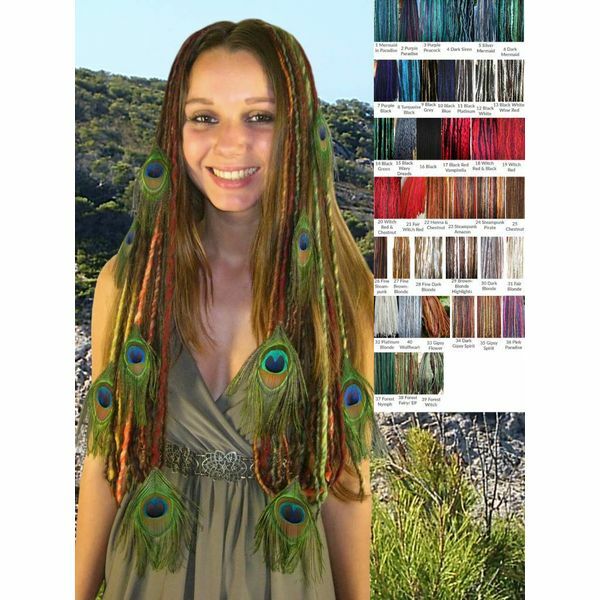 Even our clip-in dreads extensions are available with ostrich plumes and peacock feathers. Naturally you can complete your styling set with one of our many peacock headpieces or ostrich feather fascinators! All dreadlocks can be washed in lukewarm water with washing liquid or powder for sensitive fabrics and wool. Falls with decoration should only be washed if the decoration can be left outside the basin. Colors 9, 10, 11, 15, 16, 17, 32 in all offers.